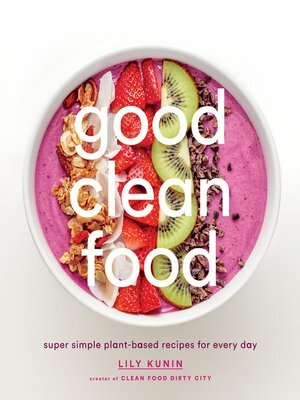 In her debut cookbook, Good Clean Food, health coach Lily Kunin shares plant-based recipes for irresistibly clean, wholesome food. With Lily's less-is-more approach, you'll learn how to create nourishing dishes, bowls, salads, smoothies, and more using gluten- and dairy-free ingredients. Her delicious recipes are complemented by the same vibrant, textured, and stunning photography that has become a trademark of her popular site Clean Food Dirty City. Organized by the way that food makes you feel—awakened, nourished, cleansed, restored, sustained, and comforted—Good Clean Food highlights key ingredients that support healthy eating and clean living. The book also features a "Bowl Builder" section that walks readers through the process of building the perfect grain bowl, and provides helpful advice on how to stock a healthy kitchen and prep for the week ahead. Helpful tips and recipes instruct on using the same ingredients from your pantry for beauty enhancement, like a raw honey-turmeric facemask and rosemary-coconut oil hair treatment. Good Clean Food reinforces the notion that clean, simple food can be beautiful, taste delicious, and provide our bodies with all the nutrients and healing properties we need to thrive.